Prototype: Czech State Railroad (ČD) type Apmz 143 passenger car. Blue-gray paint scheme. Model: This car is based on a type Bpmz 293.2 open seating car. The minimum radius for operation is 360 mm / 14-3/16". The car has type MD trucks without a generator. The 7319 current-conducting couplings or the 72021 current-conducting close couplers, the E73400/73401 lighting kits, and the 73406 pickup shoe can be installed in the car. The car has imprinted train route signs. Length over the buffers approximately 28.2 cm / 11-1/8". DC wheelset E700580. 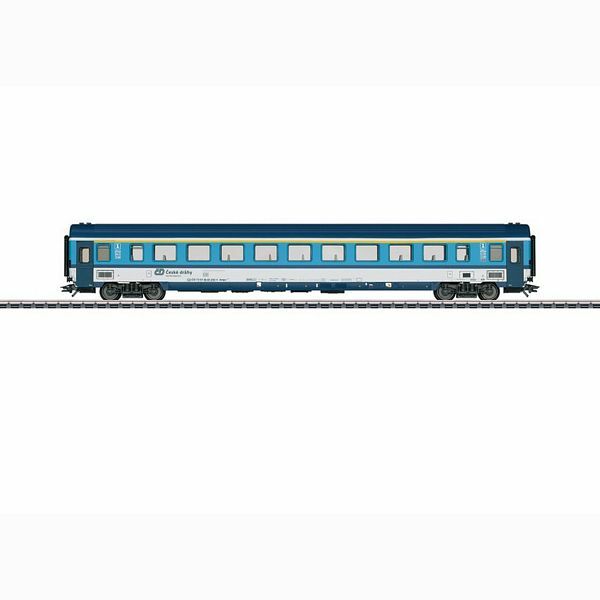 Passenger cars to go with this car can be found in the Märklin H0 assortment under item numbers 42745 and 42746. An electric locomotive to go with this car can be found in the Märklin H0 assortment under item number 36206.